Map showing the cruise track and sampling stations during the June 2011 cruise to study radiation in the pacific. On March 11, 2011, a magnitude 9 earthquake 80 miles off the northeast coast of Japan triggered a series of tsunamis that struck nearby shorelines with only a few minutes’ warning. The disaster left dozens of villages along nearly 200 miles of coast heavily damaged or completely destroyed. 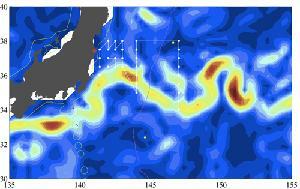 The waves, some of which measured more than 40 feet, also struck the Fukushima Daiichi nuclear power plant 150 miles north of Tokyo, disabling the plant’s emergency systems and, over the following weeks, resulted in the largest accidental release of radiation to the ocean in history. Because of the plant’s location, much of this contamination washed into the Pacific. Additional airborne radioactive material likely fell onto the sea surface, where it too mixed into the water. The need to understand the amount, type, and fate of radioactive materials released prompted a group of scientists from the U.S., Japan, and Europe to organize the first multi-disciplinary, multi-institutional research cruise in the northwestern Pacific since the events of March and April. A group of 17 researchers and technicians spent two weeks aboard the University of Hawaii research vessel R/V Kaimikai-O-Kanaloa examining many of the physical, chemical, and biological characteristics of the ocean that either determine the fate of radioactivity in the water or that are potentially affected by radiation in the marine environment. This site will chronicle and archive their work, offers more information about the methods and technology they will employ, and about radiation in the ocean. Funding generously provided by the Gordon & Betty Moore Foundation and the National Science Foundation. Our proposal for a special issue of Biogeosciences (BG) has been approved. For those who were at our Fukushima workshop in Salt Lake City, this should not be a surprise, but for others who were not there, our goal is to bring together in one journal a wide range of papers on Fukushima ocean studies. Key features of BG are the rapid online access to the initial paper, a rolling deadline for submittal, a public comment period with peer review (managed by 4 guest editors), and publication online as articles are approved. In the first stage of the process, papers that pass a rapid access review by one of the editors are immediately published on the Biogeosciences Discussions (BGD) website. They are then subject to interactive public discussion, during which the referees' comments (anonymous or attributed), additional short comments by other members of the scientific community (attributed), and the authors' replies are also published in BGD. In the second stage, the peer-review process is completed and, if accepted, the final revised papers are published in BG. To ensure publication precedence for authors, and to provide a lasting record of scientific discussion, BGD and BG are both ISSN-registered, permanently archived and fully citable. More details are available here, including a very tentative list of possible authors/titles for papers that we've heard about; you can find below basic information about the issue. I'd appreciate hearing back from you if you want to add your name to that list, and although that is not mandatory, it will help with planning. I look forward to seeing an exciting set of papers come together, and would appreciate your spreading the word. I expect in a few weeks this special issue will be announced on the BG web site and more broadly to others, but feel free to pass along this email to anyone you think might be interested. 12/05/2011: Date and time of special session on Fukushima at The Ocean Science conference in Salt Lake City released. More information in the sidebar, below right. 12/01/2011: CTD, bottle and event log from R/V KOK are now available via the WHOI BCO-DMO through the links in the sidebar.